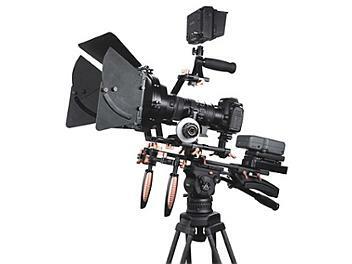 The E-Image MOKO DSLR deluxe shoulder support kit is equipped with a professional matte box. It comes with everything you need to help control light and flare using a matte box, flags and filters. Can be compatible with most video DSLRs including the Nikon D90, Canon 7D, Canon 5D Mark II and can be adapted for use with full size DSLRs such as the Canon 1D MKIV and Nikon D3s. MOKO rig system can be attached to any tripod plate easily with MOKO-adpater plate. MOKO Mattebox System: Easy Lens Changing with key function of side movement which can offer a cameraman the most convenient operation when lens need to be immediately changed and matte box is not necessary to be released completely at the same time. MOKO Adjustable base plate: With free moving up and down,as well as left and right movement. A Cameraman can adjust the center position on all the difference size of lens with the same camera. MOKO Multifunction follow focus: Can be use on all the DSLR camera or camcorder lens without changing any connect adapter ring, complete follow focus system optimized for DSLR lenses, a cameraman will gain the best quick-action shooting.